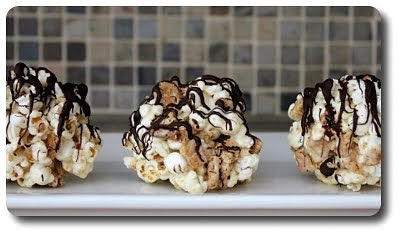 I know we just did a S'mores-like work treat with those snazzy cookies back in May, but I couldn't help myself when I came across these S'Mores Popcorn Balls. I can't remember the last time I made (let alone eaten!) 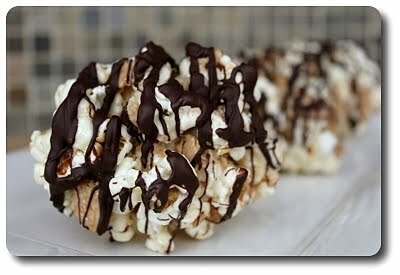 a popcorn ball, which was more than enough of an excuse to make these now instead of waiting a few more weeks. Already prepared packaged ones never really did it for me - they are usually a bit stale and rough, but fresh on the other hand is a whole other story! I'm sure Jeff's co-workers won't mind when we bring them in tomorrow for the Weekly Wednesday Treat Day! You'll need 10 cups of popped popcorn to make these, which we got from using roughly 1/2 cup kernels, popping them the good 'ol fashioned way on the stove. How much oil you use is up to you - I drizzled in about 2 tablespoons, but you could get away with as little as one. You could also use more, but this is what worked for us. Into those airy bites, we tossed in a handful of squishy miniature marshmallows and heaps of broken graham crackers. To be able to keep everything cohesive, make sure the crackers are not too large - think slightly smaller or the same size as the popcorn, about 1/2" in size. Either use a knife and hack away at the sheets (it will take about 8 to 10 rectangles for the amount needed) or use your hands to snap off small chunks. Rather than a bowl, combine the trio of ingredients in a large roasting pan if you have one - this will give you ample room to stir. What holds the popcorn balls together? 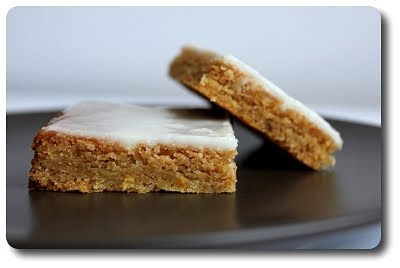 Instead of a boiled sugar syrup that you may be more accustomed to, these are made just like Rice Krispie Bars! Butter, marshmallows and a couple pinches of salt, all melted together, are first spiked with vanilla, then poured all over the popcorn concoction. Stirred to coat, leave the mixture be for a couple minutes so you don't burn your fingerprints off. As soon as it was comfortable, scoops of the popcorn were formed into tidy spheres - just be sure to keep your hands coated with cooking spray (or even better, a smear of butter!) to keep any stickiness to a minimum. To fulfill the S'mores aspect, chocolate needs to make an appearance, right? 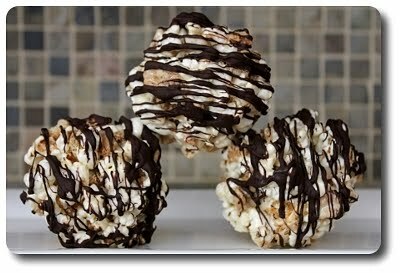 Instead of working chunks or chips of chocolate into the mixture, each crunchy, yet easy-to-eat ball, is showered in a drizzle of melted bittersweet chocolate. If your kitchen is cool enough, you can keep these stored at room temperature for a day or so before they start to loose their crunch. I, however, don't have that ability today - not only is it a scorcher outside today (hurray for a recipe that doesn't heat up the oven! ), inside the house isn't much cooler. We are having work done on the master bathroom (which means the doors are being left open as they go in and out all day! ), so I'll most likely need to keep the balls in the refrigerator to keep the chocolate firm. I also plan on wrapping each individually in either plastic wrap or dropping them into a cellophane bag. Garden update time! The plants have been doing pretty well, save for a large aphid attack - those darn tiny green monsters almost got the best of us. We thought about purchasing a sack of ladybugs to see if they would help, but just never got around to it - a good spray with water knocked most of them off, but that didn't do much to stop them from coming back (we're trying to not use any repellents or sprays - even the natural ones can kill good bugs!). Here are a few snaps of our bounty. 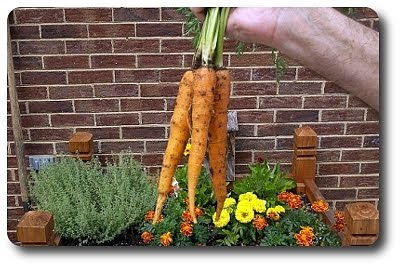 Our carrots have done quite well - we've been pulling them out for a couple weeks now and still have a good couple dozen brewing in the ground. 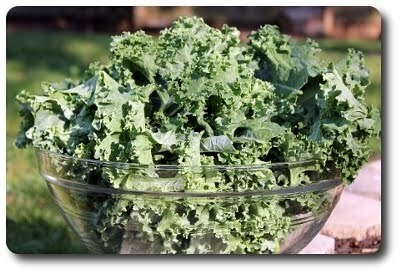 Kale was a slow start for us for whatever reason, but has actually gone a little bonkers! Here's a bowlful before we used it in a recipe a few days ago. 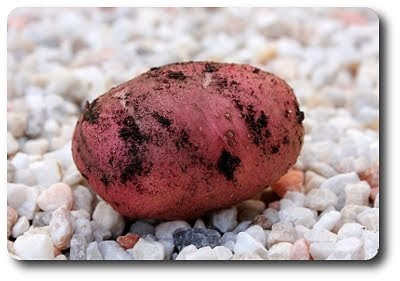 We just dug this potato out from the bed the other day - our first one! I haven't actually pulled the plants out yet, but we carefully shifted the dirt away to see what was happening underneath and found this guy. Finally we have a bounty of Swiss Chard to show you - here's about 6 pounds worth, with plenty still left behind on the plants. 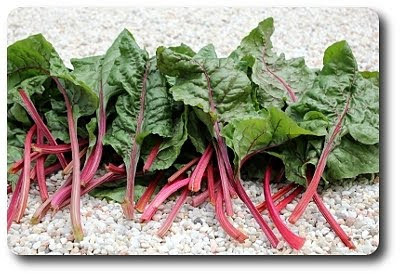 I have plans to do a repeat recipe (that Tortilla Lasagna with Swiss Chard) with some of the stalks, and Jeff brought in a big bagful into work to share today - not sure what we'll do with the rest yet. I do also have a new recipe to share with you today - a fun cookie! Let's get to it. 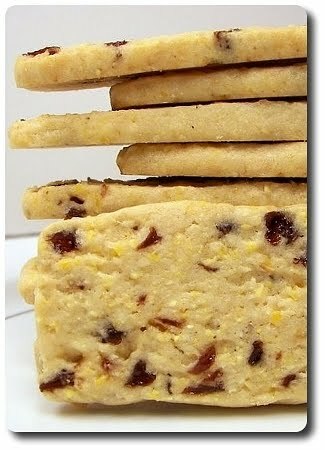 Coarse cornmeal can be used for more than just polenta or cornbread... have you ever thought of using the crunchy bits in cookies? In fact, I could have sworn we had already done just that, but for the life of me I couldn't remember exactly what they were. 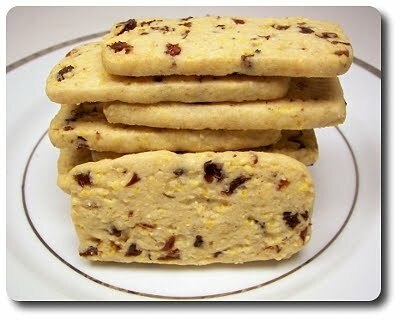 After going searching through our archives on the site, I finally managed to find that post - it was those Italian Polenta Cookies we made all the way back in '08! 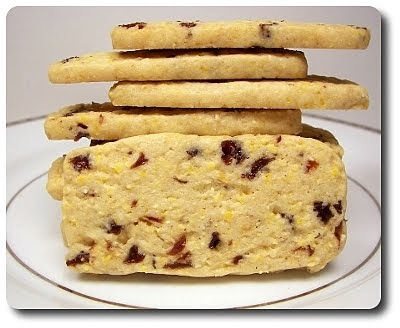 These Lavender and Cherry Cornmeal Cookies are quite different, however, in not only taste and texture, but shape too! I came across the original recipe from one of my favorite blog writers and cookbook authors, David Lebovitz, who in turn adapted it from one of Carol Field’s brilliant books (which, incidentally, looks like it is being revised and printed again with a holiday release date). I didn't make many changes at all to David's version - just two, one being a few drops of extra vanilla and the tiny dried lavender blossoms. For creating the stiff dough, you'll see I have listed coarse polenta in the ingredients - I went that route as I love the robust crunch the tiny golden pearls add. If you wish for a more sandy (or less gritty for lack of a better word) texture, look for finer dry polenta (think instant) or even regular cornmeal if that's all you have. The dried lavender blossoms can be fairly potent, so I wouldn't suggest using too much - I kept the amount to two teaspoons, which left us with a definite presence, without tasting perfume-y. As David suggested, you can use any sort of dried fruit that you think you'd like in these cookies - I kept with the theme and went with dried cherries. Unless you decide on a tiny dried fruit like currants, finely chop the pieces - if they are too chunky, the dough can become difficult to slice. 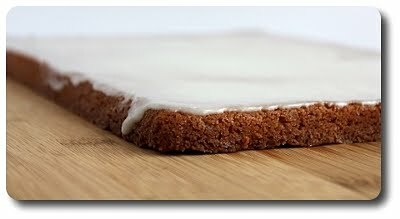 Speaking of slicing, these cookies are cut off well-chilled bricks of dough, making portioning them out a snap. 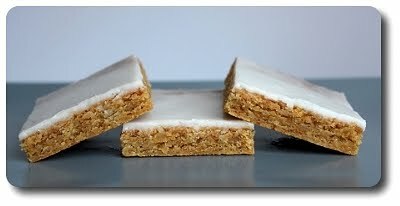 Our method gives you rectangular cookies, but if you'd like round ones, just shape the halved dough into two cylinders instead. Dividing the dough in half first not only makes for more manageable-sized pieces, but it also allows you the freedom to toss one half in the freezer for freshly baked cookies whenever the impulse arises. If you find that the dough starts to crumble at all when slicing it right from the freezer, give it a few minutes at room temperature to soften slightly. We quite enjoyed these as is, but if I were to make any other changes, I think I'd add the zest of a lemon for an extra burst of brightness. You might be wondering where the Wednesday Treat Day post is - we had to skip it this week as Jeff had another surgery on Tuesday. Not nearly as major as his neck surgery last December, but he had a rotator cuff tear that needed to be repaired, along with a large bone spur (which caused the tear!) that needed to be cleaned away. He is doing well and the surgery went as expected, but he is in a fair amount of pain... and we haven't started the physical therapy yet (tomorrow!). 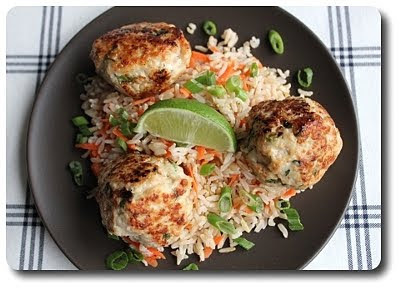 While Jeff was napping and I was in between training sessions with Dora, I did manage to sit down and write about this Asian Turkey Meatballs with Carrot Rice recipe we made for dinner recently. You'll need a pound and a half of ground turkey for the meatballs - I suggest using a combination of breast and dark meats as we've found that to be a good balance. 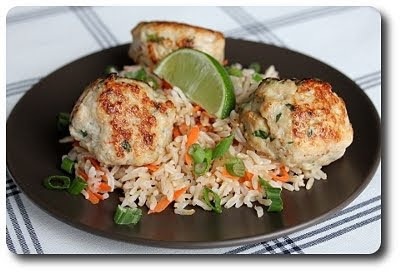 Meaning, the result will have lightness to it, yet still packs a punch in flavor and moisture. Could you simply just use either one? Sure - you could also use ground pork if you groove on that more than turkey, it just depends on what you like! To push in as much oomph into the meatballs as possible, the meat was gently combined (go easy - think meatloaf... try not to handle the mixture too much!) with the whites of a few scallions, fresh cilantro, pungent fish sauce, a few squirts of rooster sauce (Sriracha, that is), a bit of sugar to balance, and a clove or two or minced garlic. Scooped out and rolled into balls, the meaty spheres are cooked in a heated skillet to give them a crusty, golden exterior, then placed into the oven to finish baking through. You can use white rice as the bed of this dish, but we opted to go the brown rice route and augmented the directions using our favorite no-fuss method. If you'd like to do that, use the same amount of rice to roughly 1 1/2 to 1 3/4 cups of broth (or water if you are so inclined) and cook the rice using the same manner as usually do. When the rice is tender, remove the cooking vessel from the heat, scatter the shredded carrots on top and let the mixture sit, covered, for an additional 5 minutes before fluffing and serving. 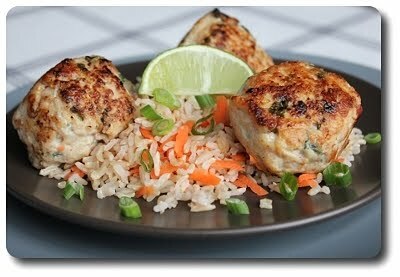 With the tender meatballs tossed on top of the colorful, orange-flecked rice, be sure to serve this dish with a wedge taken from a juicy lime to squeeze on top of each plate. It most likely would have been ok without it, but the extra acidity lifted and complimented the more complex flavors with a fresh brightness that I would have missed if it was left off. If you'd like to take out some of the prep time to make it a snap to prepare on a busy work night, you could knock out the raw meatballs the day or night before. Keep them covered in the refrigerator until you're ready to cook them - be aware that they may take an extra couple of minutes to bake through. I can't believe how fast time seems to by slipping through my fingers this spring! Between the new pup, the garden outside and all the other daily happenings around here, I'm ready to hit the sack long before I used to. While I'm still making plenty of new recipes, I'm finding myself less and less inclined to set aside time for pictures and whatnot - there are just too many other things I need to be doing! 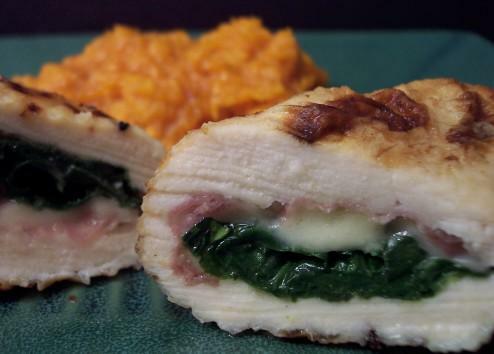 I did make an exception for these swanky Savory Chicken Pocket Pies we made recently though. 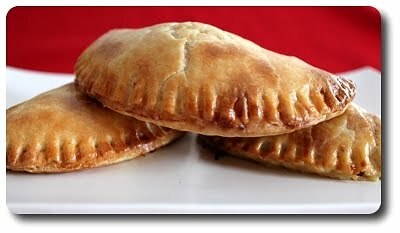 You'll want to prepare the dough for these hand pies ahead of time if you can as it needs to rest in the ice box - a couple hours would be ideal, but you could get away with as little as thirty minutes. The dough definitely isn't your ordinary pastry - butter is cut with tangy cream cheese, and both are used with a softened consistency rather than right-out-of-the-fridge cold. Instead of freezing cold water as the liquid to bring the dough into a cohesive mixture, you'll be mixing in a few tablespoons of heavy cream. While adding richness, the cream plus the cream cheese will make for a forgiving crust to work with - meaning, a snap to roll out, while still having a tender and flaky quality. Great for beginners to the world of pastry dough! A cup of shredded chicken is needed for the filling, taken from cooked chicken you've either made yourself or a snazzy rotisserie bird from the market, which is mixed into a light sauce filled with softened vegetables and seasoned with a fresh grating of salty Parmesan cheese. You can't work with this mixture right out of the skillet because it will warm your pastry and make it a mess to work with. However, if you've already made the pastry dough and are ready to move on with assembly, you can speed up this process by moving it into a bowl and setting it in the refrigerator. With the dough rolled out, we used one of our bowls that we usually fill with snacks to cut out the circles needed for the pies - use a bowl that is about five inches across on top. Don't have a bowl that size? Use a knife and go to town with free-formed rounds! 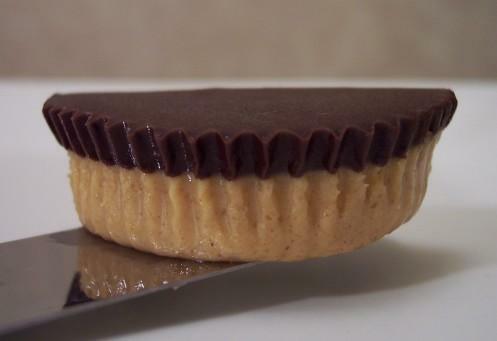 A scoop of the cooled filling, which was done by either leaving it at room temperature or hurried in the refrigerator (we opted for the latter), is dropped slightly off-center on top of each circle. 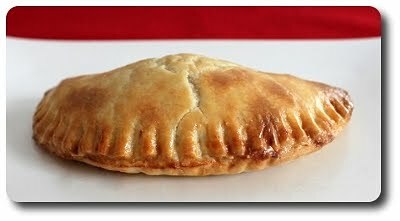 Enclosed by folding the naked side of the dough over the filling, the half-moons are sealed shut with the tines of a fork. With all this manhandling, the pies will need a quick chill once more to firm up the fat in the dough, giving them the best texture after being baked. Just before they go into the oven, we did brush each down with a light egg wash to reinforce a golden brown crust on the outside. If you have extra time one day, you could definitely assemble these ahead of time when you need a dinner-in-a-flash kind of night later in the week. Prepare them up to the point where they are sealed shut, then, instead of chilling them, arrange the pies in a single layer on a parchment-lined baking sheet and stick them in the freezer until they are firm. 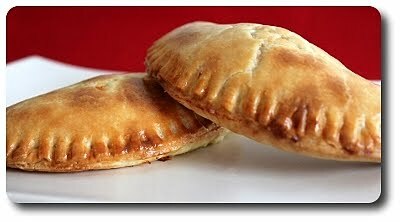 After the stint in the freezer, slide the savory pastries right into a ziploc-type bag for longer storage - you will bake them straight from the freezer, after brushing them with an egg wash, adding just a few extra minutes to the total time in the oven. 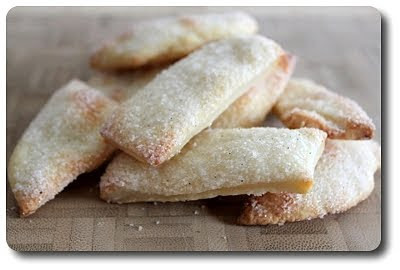 We did have leftover dough after all was said and done, but rather than toss it in the trash, we sliced the remainder into scraggly strips, showered them with vanilla sugar and baked them into sweet, pie crust-like cookie treats!